I have an adorable cat, Felix, who is a mouser. My sleep was interrupted by Felix bringing in a mouse, then losing the mouse, then trying to dislodge the mouse from an open bin with heavy pots blocking the cat’s entry to the bin. Lots of fight and flight. I opened the door to the freezing wind and took out the pots, hoping the mouse would dash to safety. No luck because the mouse had the piece of a ball of yarn wound around his neck like a lasso. The cat tore off the yarn but the mouse escaped into the top of the closet. Presently, the mouse is totally hidden and the cat won’t go out because he smells the mouse. Sleeplessly I was trying to create a parable about the only somewhat amusing incident. I thought of “fight and flight.” I once wrote a piece about the crucifixion in a book now on my web under free e-books called Mary, Teach us How to Live (rondachervin.com) The idea was that instead of fright or flight, Jesus chose total vulnerability. Later, at Mass, I was bemoaning how I can’t deal with computers. The present misery was my adobe flash getting lost when my computer crashed last week so I couldn’t test the audios on my new web site. After the usual fantasy about fleeing to some beautiful desert monastery to be a hermitess, I just vulnerably begged God to help me. This led to an unexpected fix by a genial seminarian. So, instead of fleeing to the desert, I will proudly announce to you my new web. 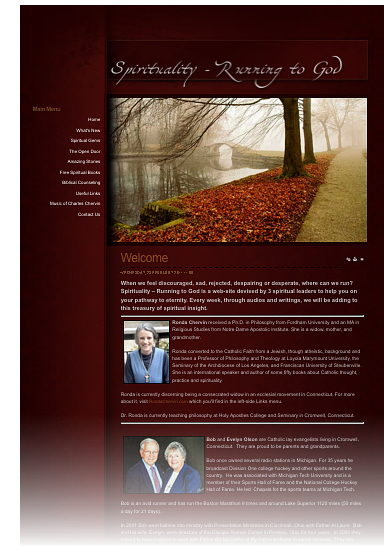 This is a spirituality web designed to reach new-agers and weak Christians. It will have lots of Catholic spirituality in it, but not in the title. If you have people you want to reach of this description go to the new web I did with friends called www.spiritualityrunningtogod.com — Sorry I am not computer literate enough to get a capital on God in this context but the new-agers won’t mind!